Mt Igcuron is a rock wall presiding over the town of Valderrama in Antique. Unfortunately, for any mountain in Valderrama, no matter how inviting it is, it always ends up being relegated either as a plan B or a side trip to the mystical Mt Baloy that dominates the horizon beyond Valderrama. At least to the zealous adventurer! That is the sad story of a mountain whose beauty surpasses that of most mountains around Manila. For the third time this year, I traversed the route from Akiki to Ambangeg. This was supposed to be our training for the Skyrace on November 26 (which has been moved to February next year). The skyrun is supposed to be a 33-km out-and-back trek and run in Mt Ugo. The longest I had run was 21-km and the two had an 11-km under their belts. 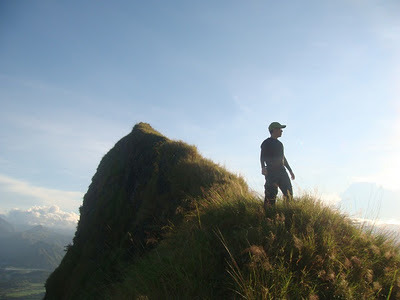 The initial plan was a Luzon 3-2-1 (Timbak-Tabayoc-Pulag) expedition but with limited budget and time we settled for a Mt Timbak- Mt Pulag expedition. It was the first time my two buddies Kevin and (Daniel) Buyco would be able to set foot on Baguio and the famous Mt Pulag so they were both excited. They were so excited that they opposed my proposal to just put off the training climb since the race had been moved to a later date. They said they had been preparing for the climb and that they might spend their budget on other stuff if the climb should be postponed. So we headed for Benguet. The impression I had the first time I saw Mt Batulao on an online photo was ‘Wow! Carstensz Pyramid!’. Since then I started dreaming of getting there. But then, it was not easy to get logistical information about mountains. So it remained a dream for quite a while. Until on a whim, in December 2007, aboard the bus to Mt Talamitan, me and my buddies changed our destination to Mt Batulao and decided to alight at Evercrest Golf Club Resort.